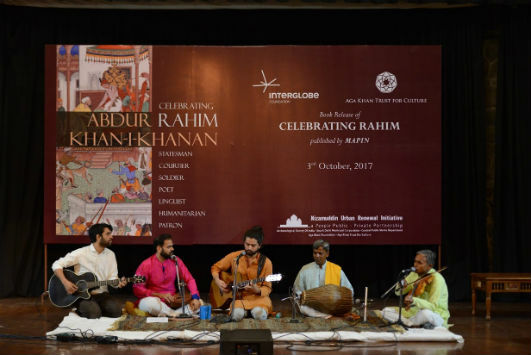 New Delhi: Celebrating Rahim: InterGlobe Foundation, the philanthropic arm of InterGlobe Enterprises, in association with Aga Khan Trust for Culture today announced the launch of the book “Celebrating Rahim”. The book comprising in-depth archival research on the life of Abdur Rahim Khan and his dohas and poetry is a part of joint conservation and culture revival project that started in 2014 under the guidance of Archaeological Survey of India (ASI). The literary evening saw book launch by the guest-of-honour Padma Shri awardee Smt. Syeda Saiyidain Hameed, former member Planning Commission of India, in the presence of Smt.Usha Sharma, Director-General, Archaeological Survey of India. This was followed by Dastangoi (a Persian art of storytelling) by Aamir Ahmed and Prateek Garg under the direction of Ankit Chadha and musical presentation of Rahim’s verses by renowned artists- Harpreet Singh, Dev Narayan Sarolia, Swaransh Mishra and Netai Das. Locating Rahim’s life, his artistic and political approach in the intellectual and imperial framework of the Mughal durbar, the evening recognised his exceptional literary talents. Essays by noted scholars shed light on Rahim’s contribution to literature, art, architecture, culture and Indian society. Simultaneously, the project is focussing on physical restoration of Rahim’s tomb by setting up the arcades, stitching of cracks, marble, sandstone cladding, canopies and dalans, interior and external surface, as well as landscaping of the site of the mausoleum, which is expected to reach completion by April 2018. 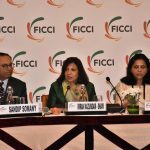 This is one of the few conservation initiatives at any of India’s nationally protected monuments that are being undertaken in collaboration with a corporate. The tomb sits prominently along the Mathura Road, formerly the Mughal Grand Trunk Road. Rahim was amongst the most important ministers in Akbar’s court. He was one of the Navratnas and continued to serve Salim after his accession to the throne as Emperor Jahangir. Besides being a strong administrator and military commander, Rahim was a great scholar and poet. He wrote verses in Turkish, Arabic, Sanskrit and Persian, translated the Baburnama in Persian and authored several prose works, including two books on astrology. The mausoleum was built by Rahim for his wife, making this the ﬁrst ever Mughal tomb built for a woman. Rahim was buried here in AD 1627.